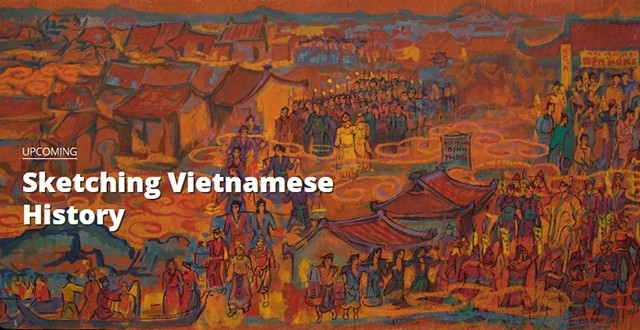 'Sketching Vietnamese History' is the first large-scale solo exhibition by senior artist Quach Phong. A project two years in production, the exhibition showcases but a fraction of what Quach Phong dreams this entire endeavor to be. On view, you will find two paper scrolls, each almost 50-meter long, with gouache sketch of events, beginning with the legendary era of Hung Kings two thousand years BC until the early Le Trung Hung era in the 1500s. This exhibition will also include the first 12 lacquer panels that bring these scroll-sketches to life, alongside an extensive video interview with the artist sharing his motivations. This ongoing labor of love is envisaged to eventually depict the history of Vietnam to the present day, determined to produce these images in lacquer as a major public art piece – as a monument to Vietnam.